The Kuwaiti investment firm that bought U.K.-based Aston Martin for $805 million in 2007 may be looking to unload the company. News of the potential sale was leaked to Bloomberg News by an anonymous insider, but Aston Martin's communications staff is, predictably, denying that a sale will take place. Aston Martin, the only major luxury marque not backed by a major automotive group, appears to be under the scrutiny of a number of potential suitors, including Indian automaker Mahindra & Mahindra Ltd., as well as Toyota Motor Corp., which hired an auditor to look into buying the legendary British nameplate. What Happened To America’s Next Great Compact Pickup? Bloomberg's confidential sources said that the Kuwaiti company that owns much of the brand, Investment Dar Co., had already approached Mahindra & Mahindra, but have thus far been unable to get what they paid for the company in 2007. The price Dar seeks is about even with the $807 million in revenue Aston Martin brought in in 2011. What happens next — if anything happens at all — is anyone's guess. 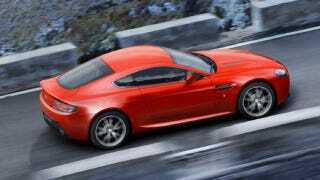 Dar, which has experienced a financial hiccup or two over the past few years, may well want to sell Aston Martin. Analysts believe the marque would be more competitive with the likes of Ferrari and Porsche if it, too, were owned by a bigger car company.